Season 2 of the Irish drama "Dominion Creek" premieres April 24 on Acorn TV. Acorn TV offers more exclusive U.S. premieres of shows and miniseries from Great Britain and beyond in April including the second season of award-winning Irish period drama Dominion Creek. “Dominion Creek,” called “An Klondike” in Ireland, follows the Connolly brothers as they travel from Ireland to the United States to seek their fortune in the 1890s Gold Rush. Update: Acorn TV is now available for Android through the Google Play store and Chromecast via its Android and iOS apps in addition to Apple TV, Roku and other devices. The premier North American streaming service for world-class TV from Britain and beyond offers a free trial and thereafter is just $4.99/month or $49.99/year. Called “a superior game of cops and robbers” (The Sun) and from the acclaimed writer of “Broadchurch,” comes a thrilling drama that is both a classic heist movie and a fascinating real-life mystery. On Aug. 8, 1963, Britain awakens to the news of the biggest robbery in the nation’s history. The Royal Mail train from Glasgow to London has been hijacked, and a gang has made off with millions in cash. Who could have executed such an audacious raid? And who can catch them and get the money back? Part 1 follows the robbers’ perspective, while Part 2changes to the copper’s perspective. Luke Evans, Martin Compston and Oscar-winner Jim Broadbent star. Patricia Hodge, James Fox and John Standing star in this gripping docudrama about Margaret Thatcher and the British government’s actions leading up to and during the conflict over the Falkland Islands in 1982. Dr. Bendor Grosvenor and Jacky Klein seek out the work of some of the biggest names in art, lying hidden in local museums and country houses all across Britain. Britain’s publicly owned art collection contains over 210,000 paintings. But at any one time, more than 80 percent of these are locked away in storage. Among this secret treasure trove of mystery paintings sit some of the finest works of art the public owns—but didn’t know they had. There might even be some priceless Old Masters lost in the vaults. Released as “Britain’s Lost Masterpieces” in the United Kingdom. Caroline Goodall stars as Anne, a successful young lawyer married to a psychiatrist (Mark Strong). While they seemingly lead a charmed life, their marriage is rocked by infidelity, and later, murder. Historian Bettany Hughes retraces the lives of three great thinkers whose ideas shaped the modern world—Karl Marx, Frederick Nietzsche and Sigmund Freud. 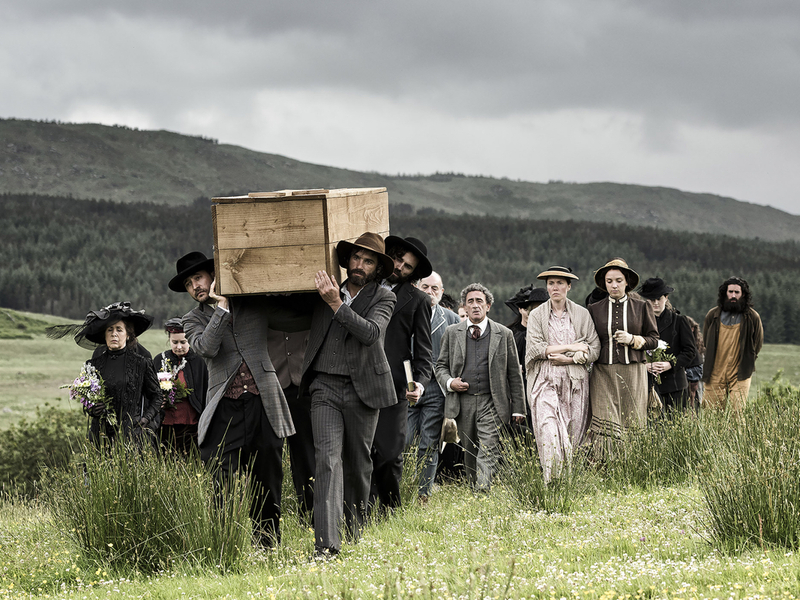 Known as “An Klondike” in Ireland, the drama won four Irish Film and TV Awards for Series 1. Series 2 has been nominated for a record 10 IFTA awards. Owen McDonnell, Seán T.Ó Meallaigh, and IFTA’s Best Lead Actor winner Dara Devaney as the Connolly brothers—three Irish emigrants seeking riches in the American Gold Rush. In the second season, the Connolly brothers are struggling to forge an empire for themselves during the gold rush of the 1890s. They stand united after establishing themselves as a force to be reckoned with in the territory. But against a backdrop of growing lawlessness in Dominion Creek, they must face a challenge that threatens to take from them all that they hold dear—family, friends and gold. Siobhán O’Kelly, Steve Wall and 2017 IFTA nominee Ned Dennehy costar. Just in case you missed Series 1 of “Dominion Creek,” I include that trailer directly above. The Series 2 trailer is at the top of this post. Season finale of the hit period mystery series 10th season. Construction workers unearthed human skulls in 2012 and again in 2015 during engineering projects in London. Since the 1800s, people have found hundreds of skulls in the city; it is one of the most intriguing mysteries of archeology in London. Researchers, archaeologists and other specialists reveal their current research and possible explanations for how and why so many skulls have been discovered.